^ 2.0 2.1 Ziesler, R.; Ardizzone, G.D. Amazon River System. The Inland waters of Latin America. Food and Agriculture Organization of the United Nations. 1979. ISBN 92-5-000780-9. （原始内容存档于2014年11月8日）. ^ Seyler, Patrick; Laurence Maurice-Bourgoin; Jean Loup Guyot. Hydrological Control on the Temporal Variability of Trace Element Concentration in the Amazon River and its Main Tributaries. 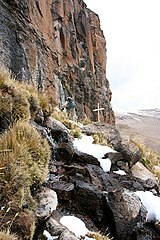 Geological Survey of Brazil (CPRM). [2010-07-24]. 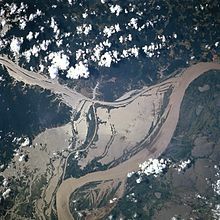 ^ Amazon River | Facts, History, Animals, & Map. Encyclopedia Britannica. [2019-03-23] （英语）. ^ 一般认同的观点，尼罗河有6650Km长度，是世界上最长的河流，第二长亚马逊河6400Km。2007年和2008年，巴西和秘鲁的联合研究证明亚马逊河的长度为6992Km，长于尼罗河的6853Km。2009年发表的一篇同行评议的文章指出，通过结合卫星地图和现场调查，尼罗河的长度为7088Km，亚马逊河6575Km。因此，目前该问题依然具有争议性. National Geographic. [2019-03-23]. ^ Gheerbrant, Alain. 第一章：肉桂幻想曲—殘暴的女勇士. 《亞馬遜雨林：人間最後的伊甸園》. 發現之旅. 15. 何敬業/譯 2003年12月15日初版五刷. 臺北: 時報文化. 1994年12月31日: 第27頁. ISBN 957-13-1556-7 （中文（台灣）‎）. 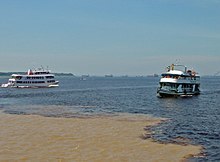 ^ Amazon River. Encyclopædia Britannica. 2010 [2010-08-03]. （原始内容存档于9 September 2010）. 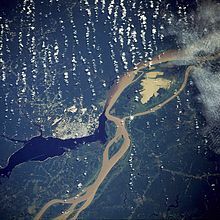 ^ 10.0 10.1 Amazon river 'longer than Nile'. BBC News. 2007-06-16 [2010-08-03]. ^ 11.0 11.1 Studies from INPE indicate that the Amazon River is 140km longer than the Nile. Brazilian National Institute For Space Research. 2008-07-01 [2013-09-04]. （原始内容存档于2016年3月4日）. ^ Source of the Amazon River Identificated (Jacek Palkiewicz). Palkiewicz.com. 1999-11-19 [2011-02-13]. ^ Explorers Pinpoint Source of the Amazon (National Geographic News). News.nationalgeographic.com. 2000-12-21 [2011-02-13]. ^ 15.0 15.1 15.2 Amazon River. Encyclopædia Britannica. 2010 [2010-08-03]. （原始内容存档于2010年9月9日）. ^ Nile River. Encyclopædia Britannica. 2010 [2010-08-03]. 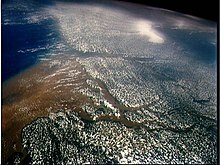 ^ 17.0 17.1 Amazon Longer Than Nile River, Scientists Say. News.nationalgeographic.com. 2010-10-28 [2011-02-13].